Giving you time back in your life. Because you don't get more time later. We kept hearing the same story. You're busy and it's all important. So, the little things tend to slip. We get it! The more people we talked to – the same story. People hitting major goals – but letting little tasks fall through the cracks. And, undone little tasks can lead to big stress. There had to be a better way to reduce stress. A way to get mundane (but important!) tasks done. Someone to help with the little things … a butler (don't laugh!). 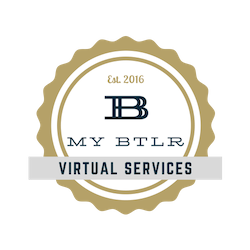 My BTLR teams you up with your own personal butler – a virtual assistant dedicated to you. Someone dedicated to your tasks – so you get the same great responsiveness every time. And, the more tasks you delegate, the more your virtual assistant gets to know you and can handle more tasks independently. Your virtual assistant builds a file for you, about you. She knows when your car needs maintenance and can set the appointment for you. Your virtual assistant can order a car service for you and your spouse – so you feel like a rock star leaving the concert. Schedule appointments, monitor plane ticket prices, return phone calls. Done. Shop online, order gifts, and research how-tos? Your virtual assistant can do that too. Any task you don't have time to get to (that isn't illegal, immoral or unethical), your virtual assistant can do for you. Okay, maybe there are a few tasks your assistant can't do ... like talk to your doctor, Social Security Administration, or the cable company (okay, maybe your virtual assistant should talk to your cable company.) But, your virtual assistant can leave a message for your doctor so you get a call back, call and hold on the line with Social Security until you get a representative and then add you to the call, and collect information about the different cable plans and present them to you so you are equipped to quickly pick the plan you want. It's time to stop worrying about tasks and start delegating – and watch them get done. Finally, you can focus on other things. The things you want to focus on. Stress-free. All because of your virtual assistant, your butler ... My BTLR.